Thai grilled chicken is a popular dish available on most street corners in Thailand. Other street vendors travel from neighborhood to neighborhood with a trail of smoke offering grilled chicken and sticky rice. Similar to KFC, some restaurants make their fame entirely on their special grilled chicken recipes. The popular styles of grilled chicken come and go. When I was kid, chicken baked in a heap of straw was the flavor of the era. I still remember the distinct aroma from burning straw. That style eventually waned. 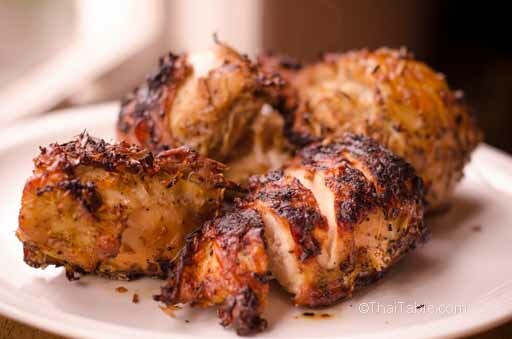 Many regional styles of grilled chicken also made their names all over the country. Some emphasize on the marinade. Others make their name through spicy dipping sauces. Recently, 5-Star Chicken (ไก่ย่างห้าดาว ), a franchise restaurant from a deep pocket conglomerate like CP Group, planned to bring their grilled chicken to the rest of Asia. When ordering grilled chicken in Thailand, there are 2 types of chicken, Thai or farm raised chicken (native or foreign). Thai chickens have long necks and legs. The meat is lean, firm and full of flavor. Farm raised chickens are meatier, fatter and more tender. Thai grilled chicken is drier, more cooked than American grilled chicken. All these grilled chicken vendors, big and small, have their own secret recipes, which are generally based on a common core. The base ingredients are salt, peppercorn, garlic and cilantro root. 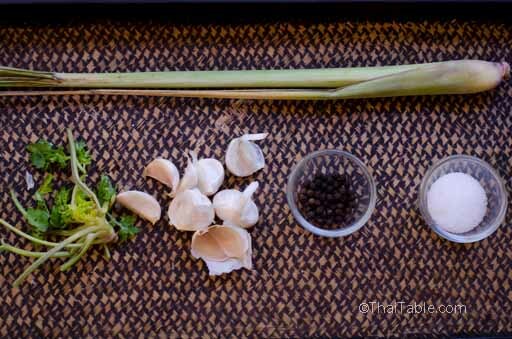 In this recipe, I add lemongrass to give the Thai spice aroma. Other ingredients in secret and not-so-secret recipes include shallots, pandan leaves, soy sauce and even milk. You can build your own secret recipe from this basic recipe. What ingredients will you add to your recipe? Serve the grilled chicken with green papaya salad and sticky rice. If you're short on time, score the chicken to get the marinade inside. Then you can grill the chicken right away. 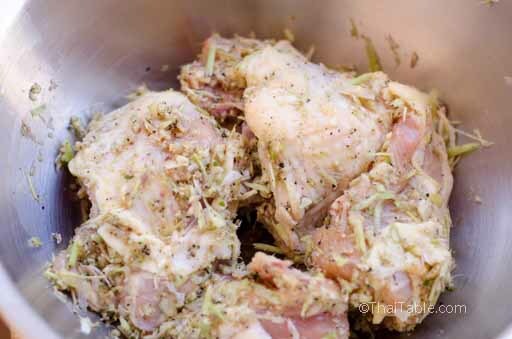 Marinate overnight to get flavor deep into the chicken. Grill the chicken on wood charcoal to give a wonderful smokey aroma, which is one of the characteristics of Thai grilled chicken. Slice the lemongrass into smaller pieces. The peppercorns should be ground in the pepper mill or in a mortar because they will escape the blade in a food processor until roughly ground (picture 2). 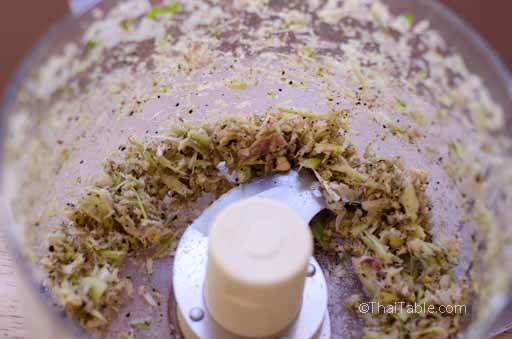 Grind lemongrass, garlic, cilantro, salt and ground pepper in a food processor. 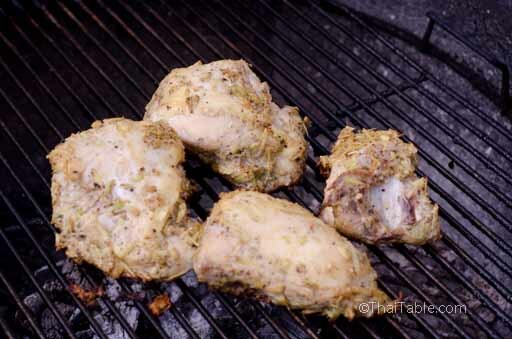 Rub the chicken with the marinate and let it sit an hour or overnight in the refrigerator before grilling. When you are ready to grill, grill the chicken over medium low flame for about 1 hour. Serve hot with sticky rice and hot shallot sauce with toasted rice.